Washington: U.S. President Barack Obama says he is looking into the option of sending lethal defensive weapons to Kyiv "if diplomacy fails" to solve the current crisis in eastern Ukraine, where pro-Russian rebels have been fighting government troops. Obama, speaking after talks in Washington with German Chancellor Angela Merkel on February 9, said he hoped that a diplomatic solution is still possible, but that it is clear Russia has violated its commitments on Ukraine. 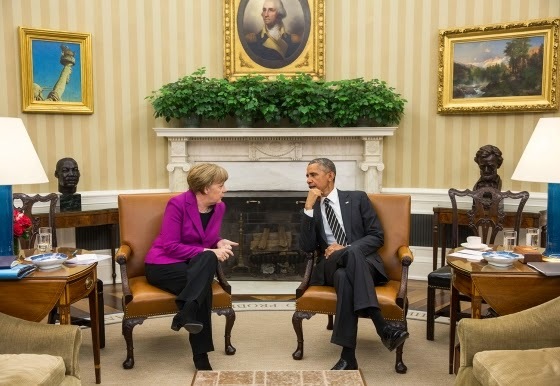 Merkel traveled to Washington February 9 to discuss with Obama the French-German efforts to revive last year's Minsk peace agreement, which collapsed amid intensified fighting in eastern Ukraine. "It's clear that they violated just about every commitment they made in the Minsk agreement, instead of withdrawing from eastern Ukraine, Russian forces continued to operate there, training separatists and helping to coordinate attacks, instead of withdrawing its arms Russia has sent in more tanks and armored personnel carriers and heavy artillery," said Obama. Merkel, who has repeately made made clear she opposes supplying Kyiv with lethal arms, admitted diplomatic efforts were largely unsuccessful, but said that they would continue. "I've always said that I don't see a military solution to this conflict but we have to put all our efforts into bringing about a diplomatic solution," Merkel said. Merkel later re-iterated her pro-diplomacy stance after a meeting with Canadian Prime Minister Stephen Harper in Ottawa. Harper in turn said he would like to see Russian President Vladimir Putin demonstrate the same dedication to a diplomatic solution. Meanwhile, Ukraine's army said February 9 that nine of its troops and seven civilians were killed in the previous a 24 hours and seven civilians also died. Fighting is particularly intense around the town of Debaltseve, a major rail and road junction northeast of the city of the rebel-controlled city of Donetsk. Meanwhile, EU foreign ministers on February 9 approved an expanded sanctions list over the conflict, but will wait to implement the measures in order to see if a proposed four-way Ukraine peace summit makes progress. The list includes assets freezes and travel bans against five Russian individuals and 14 pro-Russian separatists from Ukraine, as well as sanctions against eight entities -- one of them Russian. EU foreign policy chief Federica Mogherini said at a news conference in Brussels after the meeting, "In order to give space for our diplomatic efforts with the maximum chance of success we decided to put implementation on hold until Monday (February 16). However, German Foreign Minister Frank-Walter Steinmeier raised doubts about the proposed Minsk summit scheduled for February 11, suggesting it was not yet certain it would take place. Steinmeier said there much work must be done on “open points” before the leaders of Russia, Ukraine, France, and Germany would meet. Putin also has said the Minsk summit would not take place if the four leaders fail to agree on a "number of points" beforehand. The summit had been announced on February 7 by the German goverment's spokesman after a phone conversation between Merkel, Putin, French President Francois Hollande, Ukrainian President Petro Poroshenko. Putin, who arrived in Egypt on February 9 for a two-day visit to Egypt, said in an interview with the Egyptian state newspaper Al-Ahram that Ukraine's government should cease military operations in eastern Ukraine. He warned that Kyiv was on a "dead-end track, fraught with a big catastrophe." Others have expressed hope that the meeting on February 11 would conclude with fresh commitments to the cease-fire agreement reached in Minsk in September 2014 that has been repeatedly violated. In a statement on his website, Poroshenko expressed confidence the Minsk summit would lead to a "swift and unconditional cease-fire" between Ukrainian troops and pro-Russian separatists they are battling in eastern Ukraine. In eastern Ukraine, the separatists said that they have encircled Ukrainian troops in Debaltseve, a key junction between the rebel-held stronholds of Luhanks and Donetsk which is still under the government forces' control. "Debaltseve is encircled," said Eduard Basurin, defence chief of the self-declared Donetsk People's Republic. Basurin said up to 6,000 people remain inside the city, but did not say how many are civilians. Ukraine's military said merely that it controls the airspace over the city. Most of Debaltseve's peacetime population of 25,000 has been evacuated. On February 9, Ukrainian military spokesman Andriy Lysenko said Russia had sent an extra 1,500 troops and more than 300 military vehicles into eastern Ukraine. Last month, Poroshenko said that some 9,000 Russian troops are inside Ukraine. Monday of boosting its troop presence in separatist-held districts. Some 1,500 Russian soldiers and more than 300 military vehicles crossed over the weekend into Ukrainian territory, council spokesman Andriy Lysenko said. Ukrainian President Petro Poroshenko said last month that up to 10,000 Russian troops are in eastern Ukraine. Russia has consistently denied such allegations. Lysenko said that nine Ukrainian soldiers were killed and 26 injured in clashes over the last 24 hours. Russia denies accusations of supplying the rebels and sending troops into the conflict which has claimed more than 5,300 lives since April.